I'm getting better, last weekend I got a bad bad stumach flue. Ow my, what was I sick..
Lost a lot of weight again, slowly getting back on track, and the lovely sunshine is helping a lot. Last week the kids had vacation, we had lovely weather so could do a lot of fun things. As you can see all the sunshine we had.. There where also day's with rain, but we found enough activities to do, like painting, crafting, cooking. Not far from here one morning was organished that the kids could play, in a gymschool, what a fun they had. As it was such great weather, it was really time to clean out the mess in the garden front and back. We also went gardenstore and bought some new plants..
See both kiddos lying on the hammock, and what about the big fish?? Kids both wanted to buy something too. 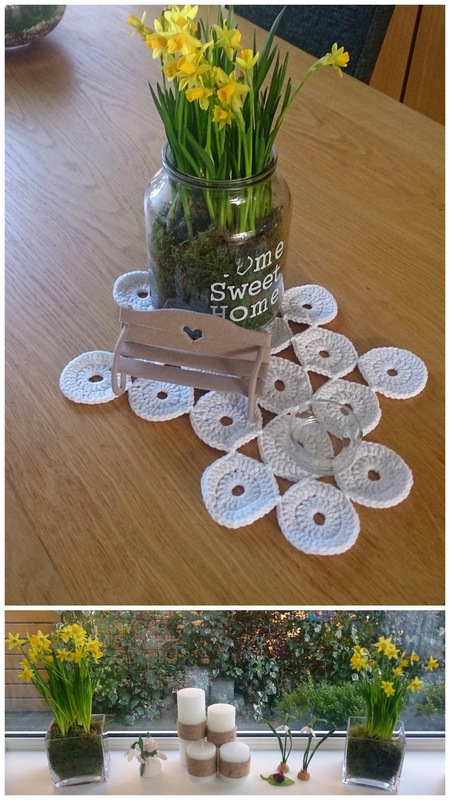 Noah choose a blue Hydrangea, Kira's plant is inside ( on the next collage to see). I also put Noah greenhouse in his place, he got it for his birthday last year, as you can see we planted some seeds, it what he likes so much. They are in our back window, already getting out of there seeds. next time I will take a picture, every day new seeds come out.. so fun to watch. Kira's plant.. a pink one.. lol..
she wanted it on her kitchen in the living, so there it is. isn't this giving you a smile?? I need to craft something for on that bench, but it will get there! These are already dead,. I was just in time with my picture. I totally forgot to take a pic of my Soda stitch, that's for the next post. But I do crochet a big big Lalylala..
After to finished above piece, I needed to order new yarn, Ordered 5 more yarn. Still not enough, but it's a doll. In a while when I order yarn, I will order 2 more for this bunny... but first I have so many other projects.. and I like her how she is already. Talking about my next project..
Time to go to bed..
Have a great week.. hope you all will have lovely sun..
fijn dat je wat beter voelt. Drukke vakantie hebben jullie gehad. Mooie foto's. Het eten ziet er ook lekker uit. Leuk al die stekjes, echt een beetje lente al. Layla is ook goed gelukt. Ben benieuwd waar je nu mee bezig bent. fijn dat jullie een goede vakantie hebben gehad. 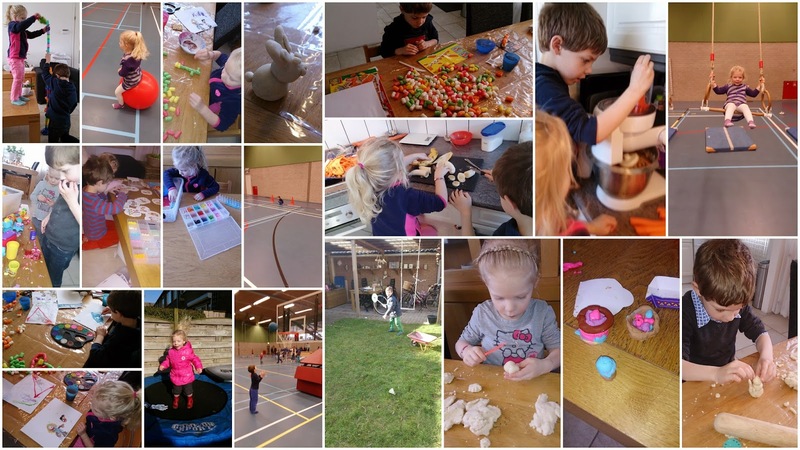 Wij deze week (nou ja de kinderen dan haha).Alleen nu nog wat meer zon! 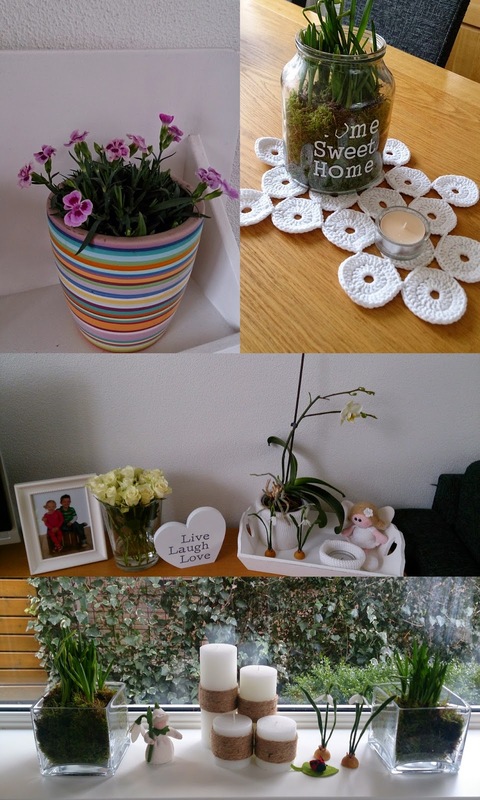 Heerlijk de lente in huis, weg met die winterspulletjes! Alles ziet er erg lekker uit trouwens! What a sunshine post . Just lovely to see what you and the children have been doing . Hope you are feeling better big hugs. Good to know that you are feeling better. You were so busy. 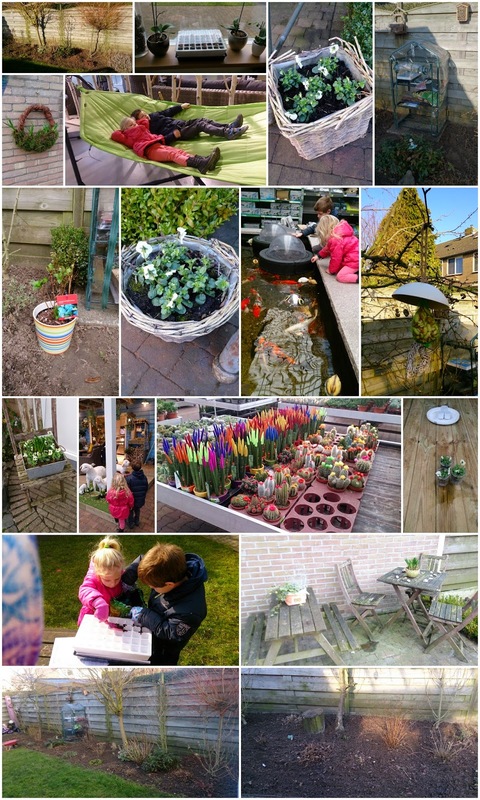 Nice to see the activities with your kids and your garden is going to be very colorful :) Here summers have started, the plants will slowly burnout by the time temperature goes beyond 40C from March end. Stomach flu is no fun at all. I'm glad you are feeling better now. I really envy all that good weather and pretty flowers. Still cold here and may snow tomorrow. Your photos are giving me hope that spring can really come! Oh dear, hope you're feeling better now. How are your feeling today, sweetie? I miss to read all blogs but especially yours :))) hugs to you my friend! I'm sure you are feeling better by now dear Annette. Stomach flus are the worst..so horrible. Love your collages! I wish I could play with you and your kids as you do all the things I like to do! Your garden is beautiful inside and out!! HUGS! How many hours are there in a day? ?